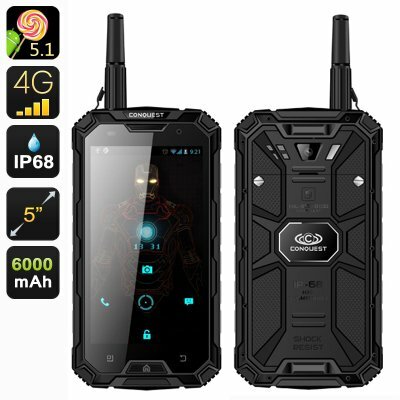 Successfully Added Conquest S8 Pro Rugged Smartphone - 5 Inch Screen, IP68, 4G, GPS, Compass, GPS, IR, Walkie Talkie, 13MP Camera (Black) to your Shopping Cart. Conquest have just launched what is probably the best and only rugged smartphone you will ever need. This beast of a phone does it all. In fact it would be quicker to list what it can’t do than what it can. With MIL-STD-810 complainant testing for true rugged prowess this phone is off the scale when it comes to toughness. A toughened Corning Gorilla Glass screen as well as IP68 waterproof and dust proof rating means the Conquest S8 Pro can withstand all the hardships you throw at it. It laughs in the face of danger as its immune to water and dust ingress and no matter how badly you treat it this phone will keep coming back for more. Like Rambo on steroids the Conquest S8 Pro can really look after itself in the great outdoors. The plethora of onboard sensors brings you navigation tools such as GPS and a compass app. You will be able to get meteorological information such as atmospheric pressure, altitude and temperature and if that wasn’t enough the phone will track your movements and record the distance you have travelled through its GPS app. If you want to communicate when away from cellular networks then this phone can take care of that through its walkie talkie support that operates on the UHF 400 to 470MHz frequencies. This is a great boon to your communication and allows you to chat with people up to 5 KM away, great for those back country treks, off-piste skiing adventures or just to avoid call charges. The rear facing 13MP rear camera has its own shutter button so you can snap shots without taking your gloves off and capture high res photos or FHD video of your finest hours. When you head back to civilization the 4G cellular connectivity will make uploading those special moments quick and easy as you can enjoy unparallel data speeds on the 4G networks. With an MTK Quad Core CPU and 2GB of RAM the Conquest S8 Pro has all the equipment you need for a powerful performance and can handle multitasking, gaming and media without missing a beat. An Android 5.1 OS provides a clean user interfaces and with loads of apps and addon avilable from the Google Play store. You can even use this stellar Smartphone to take control of the electronics around you as its IR support brings you the power to change TV channels, turn on the AC or control your DVD player. With all these features the phone needs a large battery to keep running which is why Conquest equipped the S8 Pro with a 6000mAh battery. This will bring up to 16 hours of talk time or a massive 700 hours in standby. You can also use this copious power supply to recharge your other portable devices as the Conquest S8 Pro can be used as a power bank. If you’re looking for a phone that can do it all and more, then the Conquest S8 Pro IP68 Smartphone is a worth contender and comes with a 12 months warranty, brought to you by the leader in electronic devices as well as wholesale Rugged Phones..
i have mine S8 about 11 month and performe very well.i droped in the water 3 times with no problem the battery is amazing and the walkie also.the infrared is very usefull everybody askme what phone is that and i say is a conquest s8 the best smartphone buletproof.